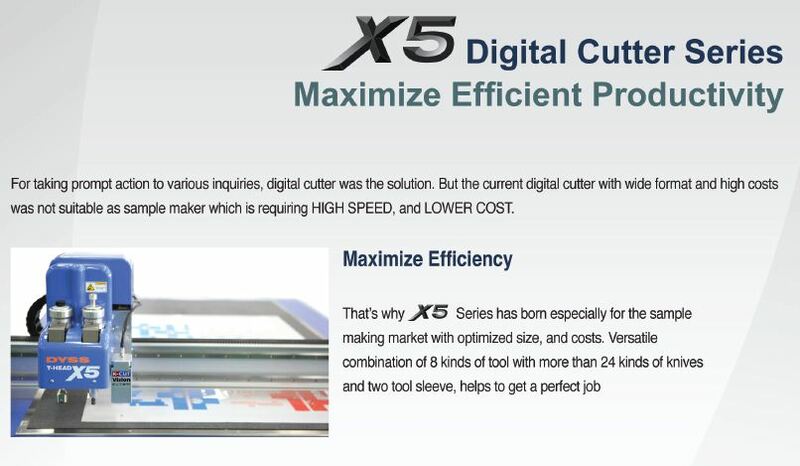 Need Blades for your Digital Cutting Table? Lesyk Superior Quality Blades are now available from PDA. Zund, Esko Kongsberg, Aristo, DYSS, Agfa Acorta and Elitron cutting tables. Lesyk have provided research & development and superior blades for over 30 years. We are building additional stocks now. Call me today with the part numbers you would like us to stock. NEW!!! X5 Cutting Tables, flexible compact and affordable! Cutting edge digital finishing for maximum productivity. With the growth of digital printing comes even shorter production runs and faster delivery times creating bottlenecks in the finishing department. 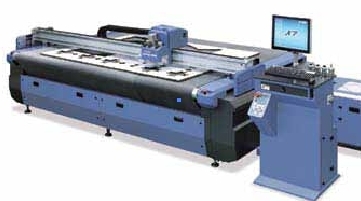 The traditional use of cutter and the “knife” for trimming and finishing becomes more costly with mistakes and reruns. This is time consuming and expensive, quality control becomes a problem under pressure. Finishing is the final component of the process and for many the last area where investment is made – the industry is changing.. The new X7 digital die cutting system will maximise your quality and productivity. Precise, efficient, camera guided, routing and cutting will automate your finishing, reducing mistakes and keeping labour down to the absolute minimum. The X7 delivers the ability to handle all varieties of common display and new emerging materials. Whether you are cutting vinyl, textiles, papers, card or undrtaking cardboard engineering with complex fold/crease/scoring patterns the X& offers all effortlessly and efficiently. 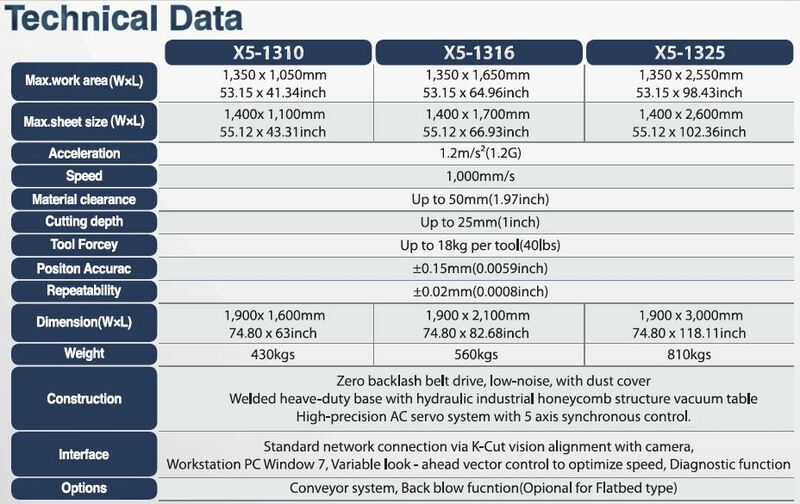 The build quality of the X7 is fundamental to the precise operation of it’s many specialised cutting tools including the 1kw precision router. 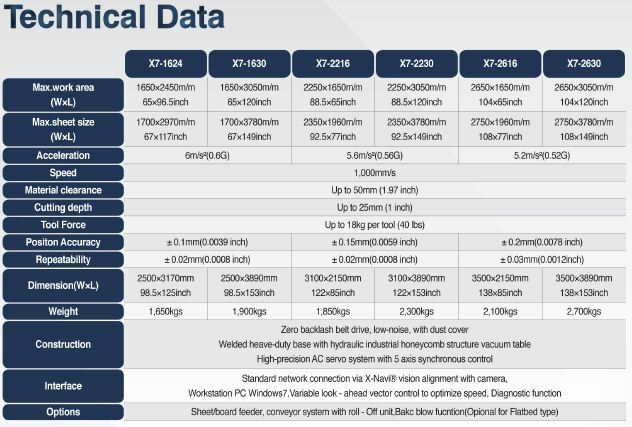 It provides a stable platform for long term reliable performance. The X7 is world class when it comes to speed and accuracy. It stands alone in construction and strenth as a sound investment fo today and your future production needs. • Precision cutting of jobs longer than the table with the automatic roll feed and conveyor system. • Sheet/board feeder and hopper allow for continuous production in a busy working environment. • Touch-N-Go! Easy tool leveling system. It enables all tools to calibrate height offset automatically. • Option of an extension conveyor increases work flow by allowing the removal of complex cut shapes whilst cutting continues. • Printing and media distortions are present in all jobs. i-cut ® or OptiSCOUT™ efficiently records these non-uniform distortions and calculates new optimized cut paths thus giving precise results time and time again. This reduces waste and enhances quality. • The new i-cut® or OptiSCOUT™ software allows the operator to select the material they are cutting and to have the option to visualize recommended tools with optimized cutting speeds. This adds efficiency and support to the operator when testing and working with new and unfamiliar materials. • DYSS workflow has many features. One uses the latest workflow integration software pioneered by MGE – such as the revolutionary i-script® RIP-to-cut interface tool and the new ai-cut™ plug-in tool developed for adobe illustrator. • Cutting paths are stored and recalled using bar codes on the printed job resulting in fewer mistakes and time being wasted in production; true work flow designed for today and the future. Please note: The information contained herein is subject to change without notice. All terms and product names may be trademarks or registered trademarks of their respective owners, and are hereby acknowledged.